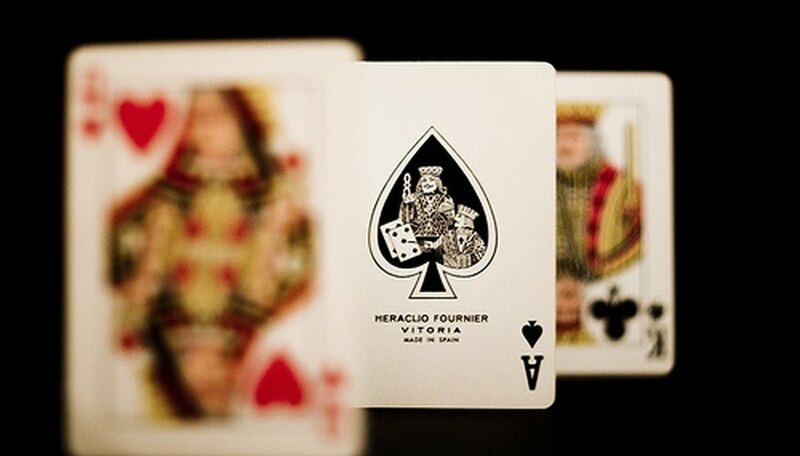 Aces High Solitaire goes by other names, such as Aces Up, Idiot's Delight, Firing Squad and Four Aces. The odds of winning at this game are usually 1in 20, and the play can be quite frustrating. Some people even introduce cheats to make the game more interesting and easier to win. The rules of Aces High Solitaire are simple and the layout of the cards occupies a very small area, so it can be played almost anywhere. In a normal solitaire game the aces have the lowest rank. In Aces High, the rank is reversed and aces occupy the top position. The game starts by shuffling the cards and dealing four face-up and put in a row. This row is known as the tableau and the remainder cards are left in a single pile face-down. Look to see if any of the four cards are of the same suit. If they are, remove the lower cards from that suit and put them in a discard pile. Deal four new cards on top of the original spaces. Again, look to see if any cards are of the same suit, and if so, discard the one with the lowest rank. Continue this process until the deck has been depleted. If one of the four spaces becomes empty, you can move a card from one of the other piles. If you are left with only four Aces in the spaces where cards were being dealt, you have won the game. There isn't much room for strategy in Aces High Solitaire. You either place the card in the tableau or discard it if it is a lower-ranked card of a duplicate same suit. Your only challenge is to make sure the lower card is always discarded. You also need to think carefully when a pile becomes empty and you can move a card from one of the three piles into the space. To make the game more interesting and increase your odds, you can implement some special rules. One of these is a common suit rule, which states that you can remove a card from the pile is it is covering a card of the same suit. For example, if one of your four stacks contains a 6 of hearts on top of a king of hearts, you would be permitted to instantly discard the 6 since both cards are of the same suit. This way of playing helps add some strategy to the game and gives you a better chance not to give up on a particularly tough solitaire game.